I have now gone though all my hives. My last post was about what that entailed. This post is about the results, what I saw for good and for bad, and the result of an experiment. 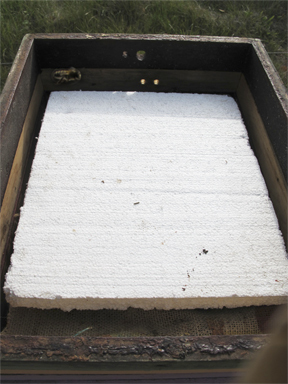 This is the answer to the question everyone asks: Over winter hive failure was 14%. This isn’t to say that every hive is looking absolutely brilliant. Some do, some don’t. I’m happy to say that queen failure was the primary cause. “Happy?” you might ask. Well, it sure beats varroa, or nosema, or starvation. Certainly no hive starved, but I’ll get to that in a second. The “alive but not brilliant” I would attribute to our winter weather (warm and wet) combined with an experiment I tried. About 50% of the queens that failed had been purposefully bred in 2014. By that I mean either I bred them or I purchased them in 2014. 30% of the queen failures were in hives whose California purchased queens had been installed in 2014. I’m not very impressed by their short-lived lives. I have gotten accustomed to hives that keep going for years (spoiled, I know). But California has been having rough times with drought, so that could be a factor. The other 20% of the queen failures were hives that had been going for between three to five years. I think I can assume they were not the original queens, but their daughters and their daughters’ daughters. So their line had a good run, and they attempted supercedures at particularly bad times (warm, but wet winter with little to no drones around). I do not replace queens on a time schedule. I replace queens only when I see that they are failing. Interestingly, this failure is often preceded by me seeing the queen quite easily. My queen choices are towards dark bees: Russians, Ferals, New World Caniolans and Hybrid-crosses of these. I figure that a hive of good dark bees is going to start getting their precious queen to safety – away from opening tops and moving frames – as soon as they can. If the queen is just hanging about, I put this down to the bees not caring to protect her and move her away from the disturbance (me), so she’s running out of steam. In the winter, usually October to March, I do not open hives and thus do not see the bees. Should a queen, and hive, begin to fail, they will do so without my seeing the action. There is an option of simply requeening with new queens every fall. But over the years, I have seen so many new queens fail, that I’m not willing to eliminate what seems to be a good queen on the chance something will go wrong in the winter. I did get a few hives impacted by Seemda – I think it affects a lot of beekeepers. You know Seemda: It “Seemed A” Good Idea At The Time. Sometimes innovations work; sometimes they are a really bad idea. The insulation does not fill then entire space, leaving room for bees and airflow. 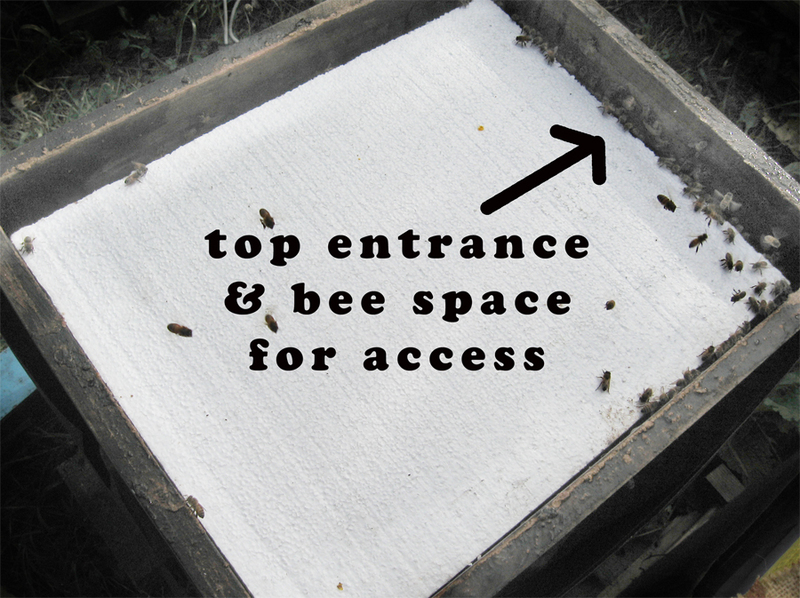 A very old post explains more (by the way I no longer wrap hives, which is shown in that post – I stopped wrapping after a successful experiment a few years back.). Lately I got to thinking “Is it doing anything at all? Or is it just making me feel good?” Well, I can tell you how it affects my hives. In hives that are in the wide-open spaces with lots of sky (we don’t always have sun, just non-rain days), the hives did fine without them. No more and no less well than when they had insulation. In hives that get more shade, it was a different situation: hives were damp, often with fungus. The bees all hunkered down in the lower boxes (I over winter in 4 westerns normally). But the clusters were smaller and weak. The sides of the boxes were very damp and many had white fungus. Conclusion: Keep the insulation in areas with a higher percentage of shade. Not only did the majority of hives come though with a good supply of honey remaining in February, but some had an entire box left. I had to shift frames around so that those bees would not get honey bound. As I was shutting up the hives for winter about five hives had such a high level of brood that I left them with five boxes. Bottom box has pollen, then two boxes full of brood (high numbers for my bees), then a fourth of honey/brood, and a box of honey. In all cases, the queens failed. Queen cells were built – but of course the wet weather and lack of drones meant that the queens and hives were doomed. I think that the presence of that much brood so late in the season may be a queen’s last “hurrah”. So when I see this, I think I’ll move some brood into nucs that have enough bees to cover the extras, and put a small over wintering nuc on top of the overly enthusiastic queen’s hive. I’m on to supering those that need supers, and feeding, with frames of honey from the queen failures, those that need honey. I’ll post more about that next week. That’s the news from Brookfield Farm Bees And Honey in Maple Falls, Washington. This weekend we’ll be at the Seattle Fremont Market, but not at the Ballard Market. I’ll be back at the Ballard Market on April 5. I’m having an enforced week off due to cataract surgery. A whole new world – or at least one with a different focal length – is opening up for me…. How did your bees come though the winter – or what are you doing to prepare your bees for the dark days to come in the southern portion of our world. 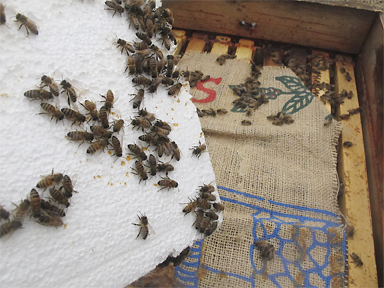 And has anyone else seen this “tons of brood from a failing queen thing?” It was new to me….. This entry was posted in Beekeeping, Hive Components and tagged Beekeeping, bees, Brookfield Farm, failure, honeybees, Maple Falls, over winter, queen, results, Washington. Bookmark the permalink.